This hyperfiction for teenagers primarily questions language and its possible inefficiency. Set in an imaginary world, the reader follows a young boy who sees an old man brewing something in a cauldron and believes he is in fact a wizard about to cast a spell. The old man sees him spying and the boy falls from his window, hits his head and loses consciousness. 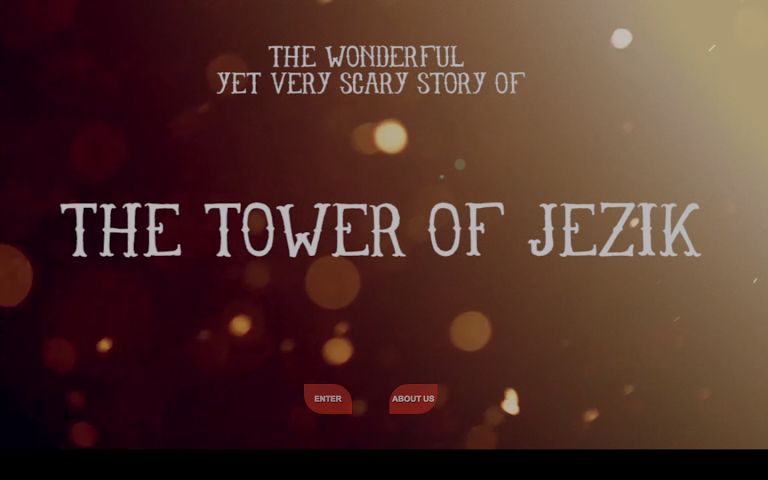 When he wakes up, he can no longer understand what people are saying and, convinced that the villagers were indeed cursed by a powerful sorcerer, he sets out to find the mythical Tower of Jezik and bring language back to his people. Unlike many hypertext fictions, Jezik has a clear storyline, but uses other strategies to resist the reader. Partly inspired by Choose-Your-Own-Adventure books, the authors set out to create a work that could fit in the standards of current publishing while playing with various media and rhetorical devices specific to electronic literature, such as patterns of hyperlinks and text animation. Denne hypertekstfiksjonen for tenåringer er en utforsking av språket og dets umulighet. Handlingen foregår i en middelaldersk fantasiverden hvor en ung gutt våkner uten språk etter et fall, og må finne det mytiske Tårnet av Jezik for å løse forbannelsen og bringe språket tilbake til sitt folk. Jezik er inspirert av eventyrbøker men forsøker også å kombinere en lineær fortelling med litterære grep som er spesifikke for elektronisk litteratur, som hypertekst og tekstanimasjon.